Sadly, for health reasons, this is my last column for the Sunday Telegraph, marking an end to my links with Telegraph newspapers which, in various guises, date back exactly 60 years. But later that year, I became the first editor of Private Eye and soon a full-tiime satirist, and also, by the end of 1962, the chief political scriptwriter, along with my old Cambridge friend David Frost, of the BBC’s ground-breaking satire show TW3 That Was The Week That Was). In 1969 the Sunday Telegraph serialised my first book, The Neophiliacs: a highly critical “study of the revolution in English life in the Fifties and Sixties” , which helped it to become quite a best-seller. And in 1972 I began a monthly “Saturday Column” in the Daily Telegraph which was to last for 20 years, where I was free to write about a whole range of subjects, from politics and religion to our destruction of the natural world and the psychology behind storytelling. Very much another theme of my writing in the early Seventies was the havoc being wrought on our cities by the make-believe of the Modern Movement in architecture and town planning, originally inspired by the utopian Twenties visions of Le Corbusier, which was then reaching its crazy climax, as in the plans to turn almost the whole of historic Covent Garden into a “space age city” of concrete tower blocks and sunken motorways. in 1979, after much of the worst of this madness had ended in disillusionment, I began several years as one of the Sunday Telegraph’s lead book reviewers. Then in1988, when the great satirist Michael Wharton took semi-retirement as “Peter Simple” of the Daily Telegraph’s long-running Way of the Worll column I was chosen to follow him as “Peter Simple II”. But in 1990 this came to abrupt end when I mocked the irascible Auberon Waugh for having written an unfortunate article loftily dismissing those “tiresome protesting students” clogging the streets of Beijing just two days before the Tiananmen Square massacre. Waugh, then a columnist on the Sunday Telegraph, issued an ultimatum to the Telegraph’s then-editor-in-chief Max Hastings, demanding that he should be given the Way of the World column in my place. My response was to suggest to Peregrine Worsthorne, then the Sunday Telegraph’s editor, that I should take over Waugh’s Sunday column in exchange. In a “job interview” over lunch at the Garrick, Worsthorne and his deputy Frank Johnson asked me “how do you see Britain’s future?” After a studied pause – this was the year of Mrs Thatcher’s downfall – I replied “sinking slowly into a sub-Marxist fog”. This seemed to please them so much that I was given the job, and thus began my 30 years as a Sunday Telegraph columnist which are finally coming to an end this week. One of the first examples I uncovered in the early days of my column, soon with the aid of thousands of letters from Telegraph readers, was the hidden revolution then taking place in the way Britain was governed, evident in in the sudden immensely damaging impact on every kind of business of a newly officious type of bureaucracy. This was notably but not exclusively due to the avalanche of directives now coming from the EU with the advent of the single market, But what it reflected was an unprecedented shift of power from our own elected politicians to an anonymously unacountable new system of lawmaking, which I soon discovered from discussions with ministers even they did not begin to understand. Thus in the Nineties, among countless other examples, I was gradually able to expose the tdisaster being imposed on our fishermen by the Common Fisheries Policy. Another was the Government’s ruthless cover-up of the terrifying damage being inflicted on the health of thousands of sheep farmers and many others by forcing them to be unwittingly exposure to highly toxic nerve-agent organo-phosphate (OP) pesticides. By 1996, based largely on what I had written in the Sunday Telegraph,my expert colleague Dr Richard North and I were able to co-author a book The Castle of Lies, subtitled “Why Britain must get out of Europe”, at a time when this was still scorned as just a ridiculously eccentric thing to suggest. By 2003 we were able to follow this up with The Great Deception, an exhaustively researched history of “the European project” which for the first time revealed the true story of how the attempt to create a “United States of Europe” had come about, much of which had never been brought to light before. In more recent years, as we have watched our entire system of government – both in “Europe” and Britain – becoming over more dysfunctional, ever more out of touch with reality and those it rules over, I fear the tone of my column has become ever more apocalyptic. I have found even grander themes to write about, such as our suicidal national energy policy, based on the “decarbonising” of our economy,which can only end in our lights going out and much else; and the even greater self-deception which lies behind it: the West’s obsession with catastrophic global warming, at a time when the rest of the world led by China and India, is taking not the slightest notice, as it continues to build thousands more coal-fired power stations. This is only one symptom of the way in which the societies of the West, spoiled by decades of the greatest material prosperity the world has ever known, fuelled by a mounting sea of debt has been showing all the signs of what, in another age, would have been seen as “decadence”. Another symptom has been the unprecedented unleashing of every kind of individual and collective egotism expressed not just in the anger and exhibitionism of the “anti-social media” but in the astonishing pressure to conform with the intolerant puritanical groupthink behind every kind of “political correctness”. We have seen not only the wholesale disintegration of traditional family life but also that horrifying scandal which for nine years was another theme of my column, as I tried to expose the dehumanised way in which our ultra-secretive state “child protection” system has gone so tragically off the rails. We are told we should try to leave the world in slightly better shape than we found it. But as I prepare to leave it I have too long felt that I was no longer trying to change it but was only writing its epitaph. Nevertheless I cannot forget all the thousands of admirable people I have come across through my years writing for the Telegraph. To them and all my loyal readers I am profoundly grateful. I am profoundly grateful for the 20 years I have known Christopher as a friend and mentor, though I first met him C1968. My life has been enriched by Christopher’s work & his friendship. Here’s wishing him and his family all the best as they face the challenges of the future in the short term.. I will greatly miss Christopher who I first met in the late 1960s. I have read and learned a great deal from his books and contributions in the media, which I have read asiduously for many years. Christopher as a mentor was unparallelled and as a friend he was generous with his time, his contacts and his knowledge – ever willing to clarify any details. I was honoured to feature in his articles several times. 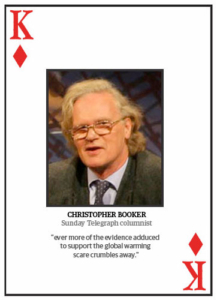 I will greatly miss Christopher’s regular flow of sound, well informed common sense & his fearless investigative journalism – I doubt we will see his caliber of journalism again in the greatly depleted columns of the Telegraph, as they follow the MSM & slide deeper into the vacuous realms of gossip, slebs, group think & populism. I wish Christopher and his family continued strength in the challenges that now face them in the short term.